The power of three is the hot trend on Broadway and all we can say is yes, yes, yes! As the master put it “One's impossible, two is dreary, Three is company, safe and cheery.” A look at six shows that have three female stars leading them. Opening tonight the bio-musical about the Queen of Disco employs three divas to play the music icon. Tony winner LaChanze stars as a later in life Donna, a wife and mother and music legend looking back on how her life brought her to that point. Ariana DeBose gives a fierce AF performance as Disco Donna, the ‘70s star that ruled Studio 54 and the radio waves for decades. She is serving you vocals, dance, and lewks. Newcomer Storm Lever rounds out the trio as Duckling Donna, the sweet young talent who finds her voice bringing her church community to tears. Each a star in their own right, together the ladies truly sparkle. Similarly when the highly-anticipated bio-musical about the one-and-only Cher arrives on Broadway next year, it will star three women each taking on a different section of the Oscar winner’s life. Tony nominee Stephanie J Block will take on Star, former Wicked star Teal Wicks plays ‘70s Cher—known here as Lady—and Micaela Diamonds makes her debut as Baby. Sometimes it takes three stars to bring a true legend to the stage. One can argue this Donna Summer/Cher model was born in Edward Albee’s Pulitzer Prize-winning play about his mother at three different points in her life. A at 92, B at 52 and C at 26 meet in the ether to look back on (and forward through) their shared life. Each illuminating a piece a pie that makes a complete life. Performed by Oscar & Tony winner Glenda Jackson, Tony & Emmy winner Laurie Metcalf and Tony nominee Alison Pill, Three Tall Women is the epitome of what the power of three could be. You’d be hard-pressed to find a fiercer trio on Broadway. The long-running favorite Waitress celebrates the power of female friendship through Jenna and her corky, loyal, and lovable co-workers and friends, Becky & Dawn. Right now, with Katharine McPhee, NaTasha Yvette Williams and Caitlin Houlahan, this friendship becomes the cornerstone of the piece and the heart of the Sara Barilles tuner. Not every trio is as sweet as the ladies at Joe’s Pie Diner. The Plastics rule their high school through fear and intimidation, and they are everything. 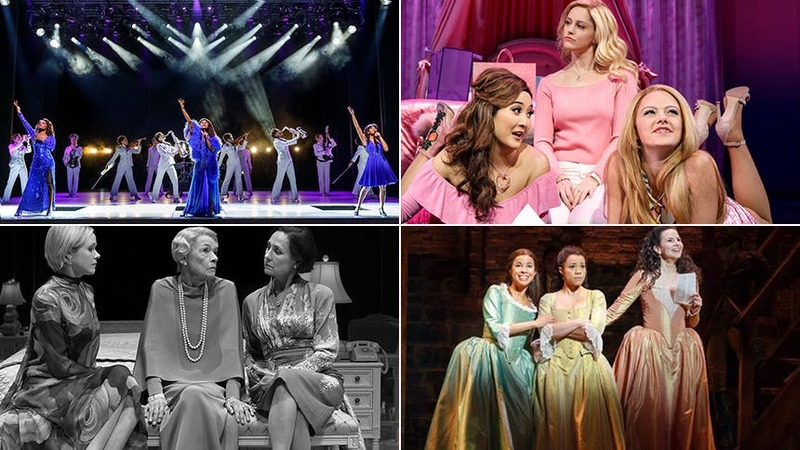 The beloved title characters of Tina Fey’s cult film come to vivid life on Broadway in a new way thanks to the strong, original performances by Taylor Louderman (Regina), Ashley Park (Gretchen) and Kate Rockwell (Karen). They each are incredible alone, but when they come together, it’s like Broadway’s version of Marvel’s The Avengers. Then there’s Angelica, Eliza…and Peggy, The Schuyler Sisters of the blockbuster musical Hamilton. These are powerful women who make you feel strong and inspired. These characters (played by Mandy Gonzalez, Lexi Lawson & Joanna Jones) elevate Hamilton beyond just the coolest history lesson ever—they each help to reveal the human side of a genius and revolutionary. Werk!